He is seriously gorgeous. He was estimated worth 3-3500 Marks decades ago, though no one could not tell with certainty whether he is a Steiff or possibly a Bing. I would appreciate - if someone recognised who manufactured this darling - to share this information with me. I hope you enjoy the pictures! What a lovely looking bear, he certainly is very handsome. I have looked through some of my books and yes he does look more like an early steiff than a bing but his eyes look wrong. Early steiff were black boot buttons and yours looks like larger two colour eyes which bing did have after the first world war. Perhaps this bear had his eyes replaced at some time in the past. But his nose stitch does look more Steiff than bing. Bing bears seem to have a thicker stitch between the nose and the mouth. 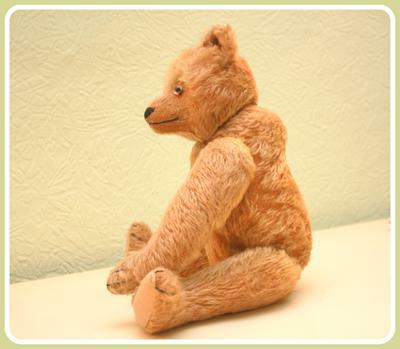 It can be very difficult to identify these old bears as their designs often copied each other. I am no expert but my feeling is he is more Steiff than anything else. Shame there is no tags or ear button. Perhaps someone else can help identify this bear. I'm a Steiff collector. I think it is a Bing; they have a distinctive, long muzzle. I'm pretty sure. 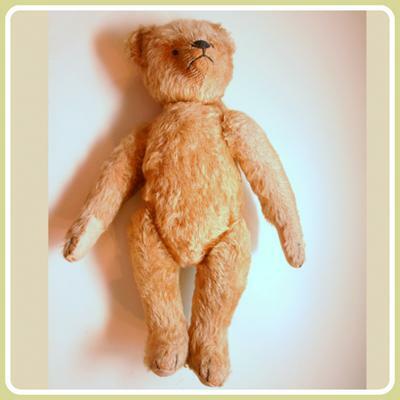 Looks like a verna bear made in Australia between 1940s to 1980s. My bear is similar but small black eyes and less nose stitching at the top snout part. Seams down back and front trunk but not on legs. Have you got any further ahead with knowing? Hallo, ihr Beitrag ist nun schon etwas älter. Aber ich habe gerade Kunst und Krempel angeschaut.BR-Fernsehen. Hier wurde gerade dieser Bär gezeigt. Es ist tatsächlich eindeutig ein Bing. Hi, ... this is mine. Don't know his name also. Seams at the front of his belly. Seams at the back/top of his legs. Seams at the top of his arms. 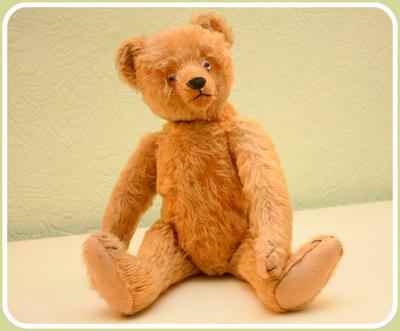 To me this Teddy looks more like a Bing than a Steiff. Does he has seams on the backside of his leg? Would be another hint for a Bing. Thank you so much Kate , I have never thought about that. Looking closer this might be a serious possibility, for everyone so far has leaned towards Steiff. But, now after you said that it really seems the eyes have been replaced it is close to obvious. Although I like them, they really make this bear totally alive. Thank you so much for your feedback, I really appreciate it!